A crushable wool felt hat from Stetson is the ideal traveling companion and is ready for your next adventure. For travel and everyday, you'll appreciate the versatility of crushable Stetson hats. 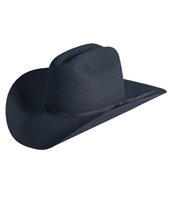 The Stetson Powder River cowboy hat has plenty to boast about, foremost - handsome mink-hued buffalo felt. The brand name "Resistol" means to resist all weather, and that's exactly what this hat will do for you. Designed with ropers in mind!